If you're going to do something, do it well. Danny Gargan has worked every day of his life on the racetrack, but he didn't start out wanting to be a horse trainer. It's a curious beginning for the conditioner and part-owner of G3 Withers winner Tax, a strong prospect on the Road to the Kentucky Derby. The 3-year-old Tax, a gelded son of Arch, also likes to win. Gargan claimed the horse for $50,000 at Keeneland in his second career start, and in his next outing Tax finished a good third in the G2 Remsen Stakes. In Saturday's Withers, Tax ran very gamely to prevail by a head in a three-way finish at the wire. The trainer recalled the first time he set eyes on Tax, watching the horse's first race in a $30,000 maiden claiming event via simulcast feed from Churchill Downs. The Claiborne homebred impressed Gargan in the post parade with his size and good looks and ran to that impression with a second-place finish, beaten just half a length. When Gargan saw Tax had been entered for the $50,000 tag at Keeneland in October, he got on a plane. Gargan said he didn't change much with Tax to step him up into graded stakes company. The only two significant alterations were in adding Lasix to his race-day regimen and continuing to improve on the horse's fitness level. “I don't want anybody thinking I have some magic genie in a bottle; I don't,” he said. “I got a good horse from a good trainer. Colebrook and Gargan are friends off the racetrack, but when the racing starts it's all business, Gargan explained. Gargan particularly enjoys the claiming game and said he will claim horses off anyone, including his friends. It's a business Gargan has seen from a number of different angles. His father, also named Danny, was a jockey who won the 1973 Kentucky Oaks aboard Bag of Tunes. Unfortunately the elder Gargan passed away when his son was very young. Merrill Scherer, Mark Hennig, and “Doc” Gary Lavin were some of Gargan's biggest influences as a young man, helping him navigate what he referred to as the “party phase” of his teenage years. By age 21, Gargan had made his way to New York working as an assistant trainer to Nick Zito, but he wasn't seeking the head trainer's title. 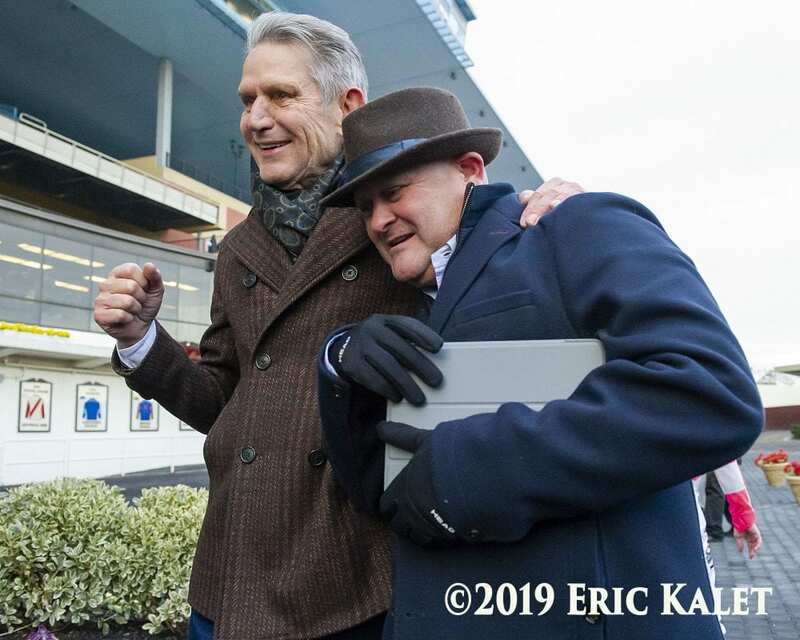 Instead, Gargan became a jockey's agent for several meet-leading riders around the racing circuit, including Jesus Castanon, Brian Hernandez and Pat Valenzuela. Eventually he found himself “burnt out” with the agent lifestyle, and Gargan bought a couple horses and started “tinkering” with them in Kentucky. It was NYRA's P.J. Campo who convinced Gargan to start training full-time, and in 2013 Gargan brought his small string to New York. “It's all just snowballed from there,” said Gargan. One of the best horses he's trained was also a fortuitous pull from the claiming box. Divine Miss Grey, winner of the G2 Chilukki Stakes last November at Churchill Downs, was a $16,000 claim in March of 2017. Since then, the 5-year-old Divine Park mare has earned over $800,000, and she remains in training for the 2019 season. As for Tax, Gargan is considering running him in either Turfway's Jeff Ruby Steaks or the Tampa Bay Derby, or perhaps just training the gelding up to the Wood Memorial. He is not being considered for Aqueduct's Gotham Stakes because the one-turn mile wouldn't suit the distance-bred son out of a Giant's Causeway mare. This entry was posted in Connections, NL List, People and tagged Breeders' Cup presents Connections, Chelsea Hackbarth, Connections, Danny Gargan, divine miss grey, kentucky derby, road to the kentucky derby, tax by Chelsea Hackbarth. Bookmark the permalink.